UUUUUU Ribe! - What's That You Say, Mrs. Robinson? Dan R. (as in Mr. Kris Robinson? ), please be advised that I am Kris's homie first, and an A's fan second. 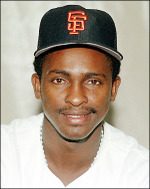 BTW, the hell you guys doing signing Barry Bonds again? Ps. Why are A's fan allowed to comment on your blog. Can't you put in an edit for this? Such sweet memories I have of this little guy. It is amazing that this story is on the front page of cnn & msnbc. More news coverage for this little known shortstop in death than in life. You know I'm not a Giant's fan and that's only because I'm an A's fan. But this is simply horrible! Well, getting this news first from your blog rather than the impersonal mainstream media takes a slight sting out of this sad moment.